Tom is co-owner and an Oyster Grower of Charleston Oyster Farm. The first time Tom and his brother came to Charleston, was during a semester at sea in high school. From that point on, the twins were enamored by the beauty of coastal South Carolina. Tom studied Marine Science and Coastal Geology at Coastal Carolina University and after graduation he moved to Folly Island, SC where he applied his knowledge and appreciation of the environment by giving eco paddle board tours around the marshes. While teaching visitors about our marsh ecosystems, Tom began to diversify his talents, and began working in marine construction, salvaging and repairing boats, fixing and building docks, and commercial diving. Then, in 2015, after hearing his brother talk non-stop about his love for oysters and how great they are for the environment,Tom caught the oyster bug too (the doctor said it's contagious and there's no cure), and decided people shouldn't be the only singles in Charleston anymore. And so he began to make moves towards starting the first oyster farm in Charleston, specializing in local. salty. singles. Peter is co-owner and Oyster Wrangler of Charleston Oyster Farm. As stated above, like his brother, Peter's first time to Charleston was through the jetties, visiting port during a high school semester at sea. It was this nautical venture that led Peter to the Holy City. As a good steward to the earth in which we live, Peter studied Geology and Environmental Geoscience at the College of Charleston. 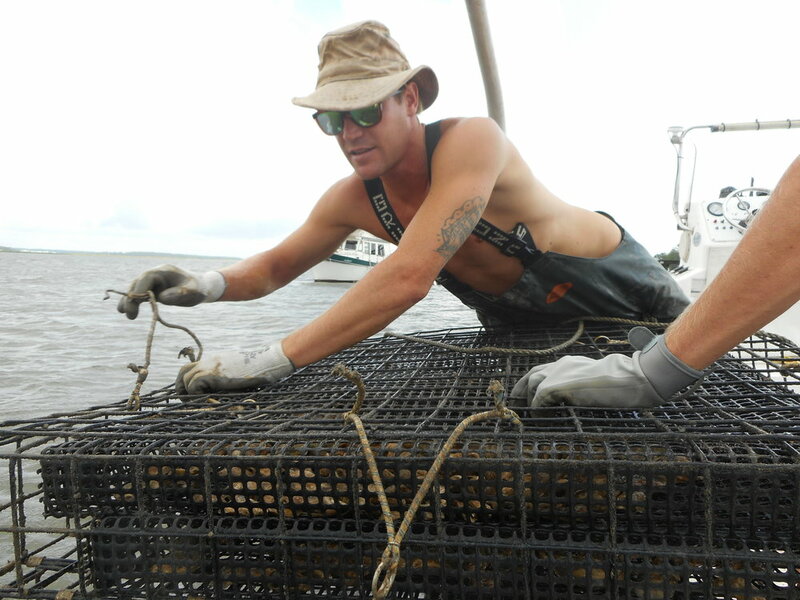 Upon graduating, Peter worked for the SCORE program at SC Department of Natural Resources, helping rejuvenate wild oyster populations across South Carolina. After several years he fell in love with Crassostrea virginica and moved up to South Carolina Mariculture Manager at SCDNR, where he managed different mariculture operations along coastal South Carolina. After years of dedication to the great SCDNR, Peter decided to join his brother in the quest for farming and providing sweet salty singles to the world. Fun fact, Peter has the same birthday as Tom. Caitlyn is the Oyster Queen of Charleston Oyster Farm, and along with helping on the farm, she manages marketing, sales, business, and social media and is an adjunct Geology Professor at the College of Charleston. Originally from Atlanta, GA, Caitlyn grew up visiting her family in Charleston for the holidays, where she began eating oysters (also maybe pluff mud) before she could even walk. It was this love for the lowcountry that culminated her passion for food, nature, and science. Upon graduation from high school she attended College of Charleston "the furthest school ever" (according to her mother). Caitlyn studied Geology and Environmental Geosciences for her bachelors (where she met Peter and eventually married him), and Environmental Studies (specifically water quality) for her Masters. While obtaining her degrees she worked at several restaurants around Charleston, and became passionate about sustainable local food and flavor. As an environmental geologist, Caitlyn was determined to find a career that could combine her passion for food and the environment, while giving back to the world, and so when the twins asked for help, she decided it would be shellfish not to.